Superintendent Lascano is drawn into a war between the Buenos Aires chief of police and the Apostles, drug-dealing cops who want to control the city. When the chief of police is murdered, Lascano becomes the Apostles’ next target. His only way out of the country is to retrieve the loot from a bungled bank robbery. Ernesto Mallo paints a scathing portrait of Argentina, where the Junta’s generals are paraded in court in civilian clothes and treated like mere petty thieves. Corruption and violence continue to rule, but at the center of the novel lies a touching portrayal of two broken men, a cop and a robber, whose humanity is sorely tested by the troubles racking their beloved country. First published more than a decade ago and set in the 1980s among the messy aftermath of the military junta that terrorised Argentina for years following a right-wing overthrow of the Argentinean government in 1976, Ernesto Mallo's SWEET MONEY is a slim but powerful crime novel. Buenos Aires is a city rife with corruption. Many of those in positions of power are more violent and criminal than the criminals they're theoretically tasked with stopping. Inside this maelstrom, Superintendent Lascano tries to maintain a semblance of honour and ethics even as those very things may get you killed by those who fear and cannot trust anyone who isn't on the take alongside them. 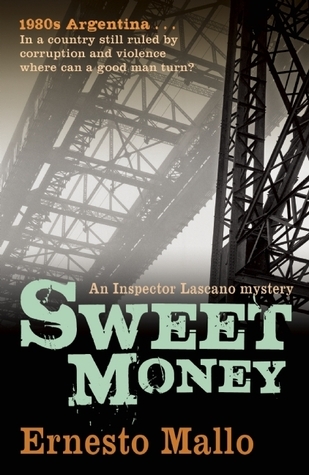 SWEET MONEY is a vivid and blistering expose of life in Argentina in the early-mid 1980s. Even as the military junta came to an end and some sort of democracy was restored, the after-effects of years where suspicion and fear were the order of the day and 30,000 people were 'disappeared' means that daily life is still turbulent and dangerous. The hyenas are scrapping for survival in a changing world. Perro Lascano is recovering from being gunned down by a death squad, but returning to his old job may be even more dangerous after the new Chief of Police, a tainted man who despite his flaws valued and protected Lascano, is murdered. Dirty cops are circling like vultures. Lascano wants to uphold justice and be a good cop, but his world may not let him. Meanwhile another man with a broken life, 'Mole' Miranda, is released from prison. A non-violent robber who has his own sense of honour, Mole is forced to return to his former life despite wanting to go straight. When the ' one last job' goes horribly wrong, Mole finds Lascano on his tail. Two rather decent men in a corrupt society. Mallo delivers a compelling, gritty, atmospheric tale in his own distinct style. For example, dialogue is run-together in italics, which takes a wee adjustment by readers, but the story is so good that I didn't find it too distracting and quickly got into the flow. There's plenty of 'bigger' ideas and issues touched upon as the crime story unfolds, giving SWEET MONEY a strong sense of layer and depth. Lascano is a philosophical character, and the author muses on various topics throughout, but this never takes away from the rich story. 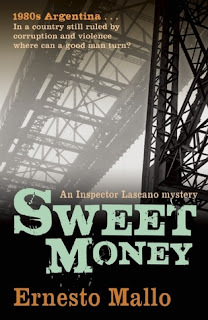 The second in a planned trilogy, SWEET MONEY is a terrific book and we can only hope that at some point English-speaking readers can look forward to a third.